Star Wars: The Rise of Skywalker lands in theaters on December 20, 2019. Although, I agree that it's not always awesome as it was in my childhood. Again, we don't have Jar Jar Binks and these new series try to look more serious than 1-3 eps. mcborge, doomworm, lumbeeman and 3 others like this. Maybe they learned their lesson with Solo. IMO, it was almost as bad of a dog as Star Trek: Into Darkness. I tried watching Solo, but could only stand to sit there for the first 20-minutes. This trailer makes the movie look like it could be very good. Then again, I am drawn to the more mystical aspects. 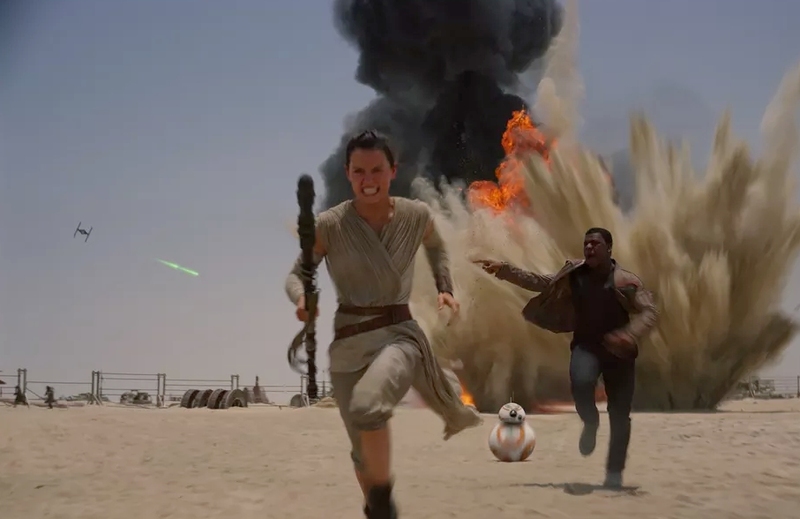 For me, The Force Awakens was nothing more than a boring rehash of IV. With the more mystical aspects, I found The Last Jedi to be far better. I also liked Rogue One. They are working on the Old Republic movie right now. Interesting you should say that about Jar Jar, even if you were being sarcastic. IMO, Jar Jar was considerably better (though still somewhat cringe-worthy) in "The Clone Wars". IMO, "The Clone Wars" is an excellent series, and, perhaps, better than all of the movies combined; however, after watching it, I re-watched episodes I II, and III. III, in the SW universe, is technically after the last of "The Clone Wars", however, it was obvious that in the real world, The Clone Wars was produced much later than Episode III. 6 seasons of the Clone Wars is a lot of time to spend on character development, which the prequel trilogy utterly avoided. This trailer looks fairly interesting, and yeah... Solo. Still the only Star Wars movie I haven't seen. It's even on my movie server but I find watching Spirited Away for the 5th time notably more compelling. I cringed during the first ten minutes, or so, of Solo. It got much better once they moved past the childish build up. Oh I was being 100% real about bringing back Jar Jar, I thought he was a great character and miss his face. The wink was me expecting to get murdered by the comments for liking Jar Jar. Top comments on YouTube following the video are priceless. Do not waste time here! Force Awakens and The Last Jedi were both TRASH. I don't think the directors bothered to watch Episodes 4, 5 or 6. Rey is a Mary Sue character that only the most liberal of hollywood Feminists could have come up with. It's pathetic how these people have ruined the Star Wars saga. Decades from now: 4, 5 and 6 will still be considered the best - especially 4 and 5. The story building in 1, 2 and 3 isn't bad, but it takes away too much from the imagination. Fimbulvetr, USAvenger, Eldritch and 1 other person like this. A friend of mine said it best: Episode 9 should end with Chewy waking up from a bad dream on the Millennium Falcon just after the battle of Endor. Mjswooosh, Fimbulvetr, m4a4 and 2 others like this. I was 5 years old as well when I saw that in the theater. It was a huge deal back then especially for a small child's first time ever at the movies, at least it was mine anyway. Waikano and wiyosaya like this. Like @Lew Zealand said, there is a lot of character development in The Clone Wars that could never have been done in the films. To me, he is a good character with a good heart even if he bumbles a lot. His bumbling, though, sometimes ends up saving the day, and he is quite brave. Those who judge his character based on his appearances in the movies are missing most of what he is really about, IMO. Yeah, most people, being firmly grounded in the every-day physical world, do not get the mystical aspects of The Last Jedi. I do agree with you about The Force Awakens. I have some hope for this next release, but I am not all that confident that JJ Abrams will do any of the series justice; he was, after all, at the helm of The Heart of Darkness, and The Force Awakens. Having watched I, II, and III after watching The Clone Wars, IMO, The Clone Wars was far better. My nephew was about that age. He is a BIG SW fan because of it. One could easily argue that the Mary Sue trope applies to Luke Skywalker, too, not to mention Anakin Skywalker, as his back story is told in The Clone Wars. IMO, all of the movies are more or less big-screen soap opera especially that part where Luke learns who his father is. From that viewpoint, it is easy to argue that subsequent movies had little basis to build on, not that I am defending it. Like other franchises, it seems all about the money, and unfortunately, those caught in the midst of such franchises seem to lack the understanding necessary to keep the franchise fresh. Part of what made IV, V, and VI so successful was that at the time, they were ground-breaking movies, IMO. I have not seen Star Wars: Rebels yet, but I understand that many like it as much as The Clone Wars. For me, The Clone Wars is the best of the SW universe that I have seen so far because it gives so much back story and does an excellent job of character development even if it really does not match the Anakin from III. However, if you do or have watched The Clone Wars, I cannot imagine what you would think of Asoka Tano based on your comment about Rey. For me, Rey and Finn are the best two characters in VII and VIII. Luke Skywalker had to struggle quite a bit as I recall. He stumbled at training with Obee Wan, got lost and beat up on Hoth, failed at his love interest (fortunately), failed at training with Yoda multiple times, failed to rescue his friends, failed to defeat Vader and failed to defeat the Emporer. But he had a good attitude and continued to persevere, which is why I think he made a great character. In his rush to defend Mary Sue, he must have forgotten the real struggles of Luke, not to mention getting his hand chopped off by dear old dad. The "world building" of Episode 7 and 8 are ridiculous. The First Order popped up out of nowhere. We aren't even given a "Rise" like we were in Episodes 1 - 3. You mean Snoke just magically popped up with a fleet larger than the Empire's? You mean that the Empire went from total destruction in Episode 6 to a gigantic fleet with a "Death Star" planet capable of destroying 5 planets at once? In less than 30 years? Rey knows of Han Solo...but thinks of Luke Skywalker and the Jedi as myth despite living in a crashed Star Destroyer? Rey is the very definition of a Mary Sue. She earns nothing. She excells at everything. She doesn't struggle. Luke Skywalker turns on his sister's son because he thinks he "might" turn bad? Despite risking his life to save his Father's soul when his father was a literal monster? I could attack virtually every single other scene from Episode 7 and 8. Suffice to say: both films were TRASH. They bring in new characters, handle them poorly and then just kill them off. Darth Maul was easily the best dueler next to Dooku and although his defeat is hard to swallow, it was inevitable. Another poorly handled character but poorly handled with context. What worries me tho is that these pieces of garbage have high scores on Rotten Tomatoes? Who is padding these scores? No one is really gone? More like Fall of Disney. Have you seen the theory that Jar Jar is a Sith Lord? Now that might make an interesting story. Yup! I'd pay good money to see that play out.